APRep. Charlie Rangel (D-New York). Rangel made the comments while addressing President Barack Obama’s decision to send an additional 1,500 troops to fight the Islamic State, to a total of 3,000. Administration officials insisted Friday that the White House is “not going to be putting US men and women back into combat,” but Rangel again called the claim “insulting” to veterans like him. Echoing other liberal stalwarts like Rep. Jerry Nadler (D-New York), Rangel further said the Constitution demands an official vote to go to war and Congress was abdicating its duty by not more forcefully demanding the president go through this process. “The Congress is guilty of allowing this to happen. If indeed our national security is threatened, then Congress should debate it … Congress should vote on it. There should be a universal draft. And we should set aside money or more taxes to pay for it. But how in the hell we can go to the funerals, and go further into debt, and say, ‘We’re not at war,’ challenges common sense,” said Rangel, who has long called for a draft. Rangel would vote against such a resolution, however. He said the Islamic State did not constitute enough of a national security threat. The group’s militants have beheaded multiple US hostages but have largely focused their violence in Iraq and Syria. “I just want to make it clear that if our great country’s security is being threatened, then we … should do everything we can to defend our country. I don’t know anyone who goes to sleep at night thinking ISIL and ISIS is a threat to our national security. 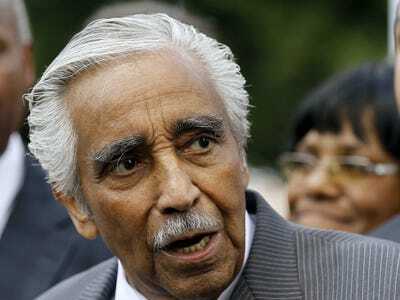 The bigger threat they are [is] to the countries in the surrounding areas, and they don’t even have boots on the ground either!” Rangel exclaimed.